The pepper seeds I planted nearly two weeks ago are starting to germinate, tiny, pointed green leaves against brown potting soil. 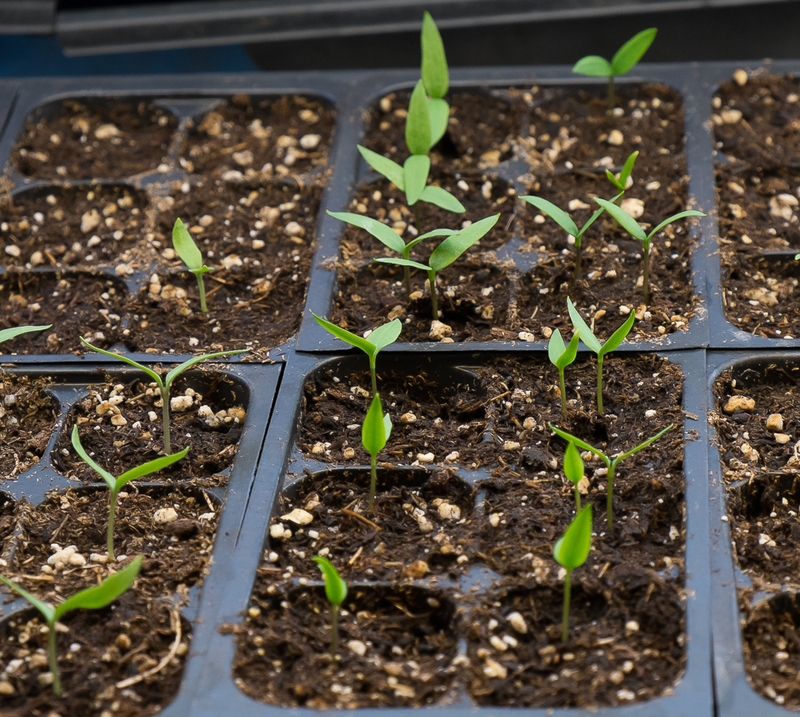 Of the trio of summer heat lovers, tomatoes, eggplant and peppers, peppers always take the longest to germinate, two weeks or more compared to a week or less for the others. Even though I’ve learned over the years that pepper seeds with their harder coating germinate more slowly, I still watch anxiously each year for the first shoots to emerge. This year I’ve planted three sweet reds: Revolution, King of the North and Carmen; two oranges: Gourmet and Gilboa; four yellows: Flavorburst, Golden Star, Superette and Golden Treasure and one poblano, Ancho Magnifico. In another week or two, I’ll move the seedlings to four-inch pots and by early May, after hardening them off, I’ll plant them in the greenhouse and in a cloche. I grow a lot of peppers, usually around 45 plants, enough for crisp fresh peppers at the height of summer but also plenty to roast and freeze for winter and early spring meals. 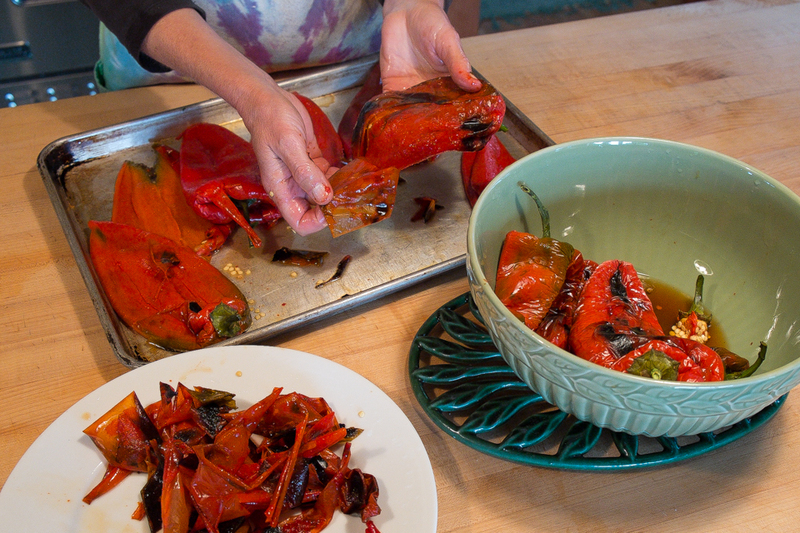 Frozen then thawed roasted peppers are as tasty and versatile as roasted peppers just off the broiler or grill. And all the time-consuming work of peeling and seeding happened back at the end of the summer. All I need to do now is thaw them. We’re still enjoying last year’s peppers on sandwiches and pizzas, in pastas and risottos and sauces as the little shoots of the coming summer’s plants put out more leaves. Last year’s supply will probably be gone before this year’s is ripe, perhaps a reason to start a few more seeds. There’s still time. This entry was posted in Summer Vegetables and tagged Freezing peppers, Growing Peppers, Pepper seedings, Pepper varieties, Roasting Peppers, Starting Pepper seeds by Lopez Island Kitchen Gardens. Bookmark the permalink. Thank you so much for the Flavorburst pepper plant you gave us last year, it is a new favorite. I may have an extra Chimayo for you (from Adaptive Seeds), if they germinate well…I’m still on pepper seed-watch here while waiting for snow to melt. I am trying to indoor seed peppers for the first time this year just as you are showing above. Perhaps you will comment in a later blog but wondering what warming and protection steps you take here in our Seattle area climate to “successfully” get them to fruit and mature to full size?